Heavenly, that's what these scones are. And I'll tell you what they're not: dry, tough, rubbery, or in anyway unpleasant (like most scones I have gotten from a bakery). They are simply heavenly, and once you've had one, you will wonder if you were ever truly happy before. These scones manage such devastating perfection because of their secret ingredient/weapon: heavy cream. It keeps them light, fluffy, and melting-in-your mouth. They're a perfect way to use up extra cream (or at least that's my excuse), and they come together really fast. The original recipe is from Williams-Sonoma, and is copied below for your baking pleasure. 1/4 c. sugar + 3 T.
In a bowl, combine flour, baking powder, salt, 1/4 cup sugar, and chocolate chips, mixing well. 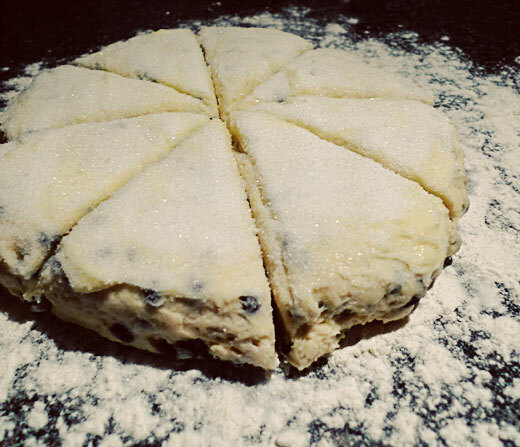 Pour in cream, mix gently with a fork until just combined and dough is holding together (will be slightly sticky). Transfer dough to a lightly floured surface and knead 10 times. Shape into a ball, than pat out into a 9-inch disk. Spread with the softened butter then sprinkle with remaining 3 T. sugar. Cut the disk into 12 pie-shaped wedges and place on a baking sheet lined with parchment paper. Bake at 425 degrees for 12-15 minutes, or until edges are just browned. Serve warm. I cut mine into 8 pieces instead of 12. Because I felt like it. -Don't overwork the dough, this will cause it to toughen. -Don't overbake, bottoms will brown but the top edges should just turn golden. -They are best eaten the same day they are baked, especially right from the oven. Use the dough as a base, and mix up the flavors by switching out the chocolate chips for other ingredients! I'm totally making these tonight. It just so happens that my fridge has been holding onto some extra heavy cream! I made them. They rocked! I put turbinado sugar on top for a little crunch. Awesome! I love crunchy sugar. Oh, man. These look divine! 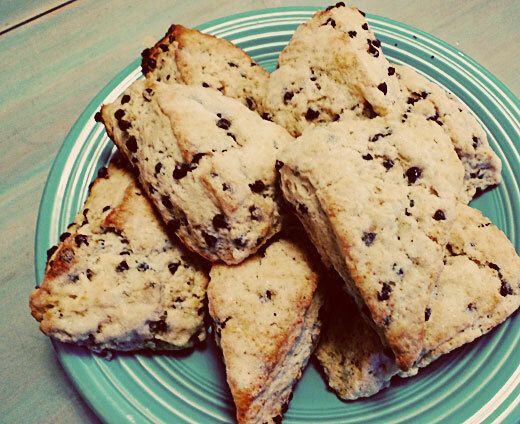 I love scones and can't wait to try these! Just made these again! This time I doubled the recipe, added 1&1/2 cup puréed pumpkin and spices and baked for a few minutes longer. Still awesome. This recipe rocks!